Basket Hilt: The English adopted the basket hilt by the mid-16th century, about the same time as the Scots. This high-quality decorated example is similar to an English broadsword hilt dated 1620. Made of iron with silver-wire damascene, it is open in design with a well defined pattern, having two junction plates and three segments, although this example is slightly deformed on one side. 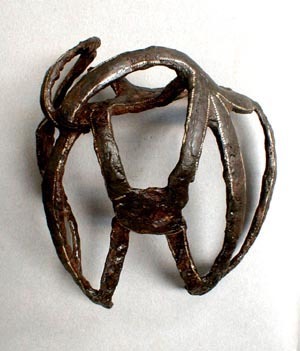 The basket hilt is regularly found in Virginia 17th-century settlement sites. This is one of two hilts decorated with silver inlay that were recovered from Jordan’s Journey near Hopewell in Prince George County.